Swimming is a sport or activity of propelling oneself through water using the limbs. Swimming is an activity that burns lots of calories, is easy on the joints, supports your weight, builds muscular strength and endurance, improves cardiovascular fitness, cools you off and refreshes you in summer, and one that you can do safely into old age. Some people who enjoy swimming want to take it to a competitive level. This can provide the health benefits of a vigorous workout as well as the fun and thrill of competition. 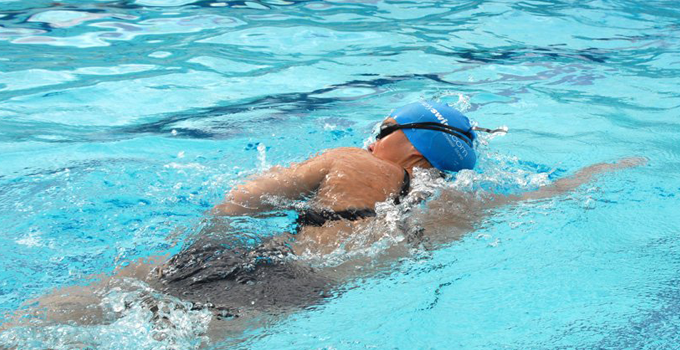 The main strokes used in competitive swimming are breaststroke, freestyle, backstroke and butterfly. The distances swum in competition swimming can vary from 50 meters in a pool to much further distances in open water such as the sea. Swimming can offer people of all ages a huge range of health benefits. You might just feel and look younger, have stronger muscles, and (according to a long time swimmer) better hair. Although you might not have awesome, shiny and chlorine enriched hair, you can find at least ten other reasons to swim. Swimming gives your body the workout minus the harsh impacts. Another benefit is the living longer factor. You prolong your life and have higher brain activity with a regular swimming program. Control your weight and have a healthier heart plus lower your risk of diabetes, stop asthma symptoms and have a higher quality of life. Before you dive in, Make sure you know how to swim, choose a safe environment, warm up and stretch your muscles and joints before entering the water and don’t overdo it if you’re just starting out. There you have it. Swimming is an activity that builds strength, endurance, and tones muscles. It’s an activity that you can do all year long, inside or outside, it burns lots of calories, you can share it with your family, it’s low-impact (just in case your bones are creaky), and you can do it until you’re 100! It’s not too late to start if you never learned how (learning new stuff is cool even when you’re adult!). All in all, swimming is a winner, and if you have the inclination, I suggest that you go for it! My daughter loves swimming and has been dreaming of having us put in a pool at our house for quite some time now. Before reading this, I had no idea that doing swimming as exercise can prolong your life and put you at a lower risk for diabetes. It seems to me like swimming is both fun, and beneficial to your health. I’ll definitely remember this as my husband and I consider getting a pool put in!